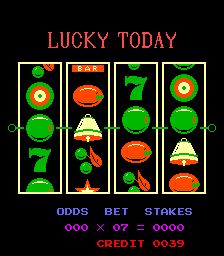 Arcade Video Game published 39 years ago by Sigma Enterprises, Inc.
Lucky Today © 1980 Sigma Enterprises. A coin operated virtual slot machine game running on Galaxian hardware. There is a clone named "Chewing Gum" that is virtually the same as "Lucky Today".